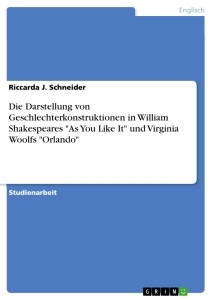 „Determined to prove a villain” – Zur Charakterisierung der Hauptfigur in Shakespeares Historie Richard III. Das 16. Jahrhundert – Treffpunkt zweier Welten ? William Shakespeare may never have existed – or at least that is the point some scholars are trying to make. This paper is going to follow the opinion of the vast majority of literary experts and assume that Shakespeare did, in fact, exist. But mere existence is never enough. “No man is an island, entire of itself,” as John Donne liked to put it. The environment you live in and the surroundings that influence and inspire you are utterly significant. Future historians ourselves, we were taught that the present is a time span that doesn’t even last three seconds. After that, it’s the past. But the past is not the same as “history” itself. History is what historiographers have managed to reconstruct of the past, using archaeological, philological, literary, and other sources. As we are happy enough to know a lot about Shakespeare’s times, it would be foolhardy and arrogant to ignore this knowledge and focus on the plays themselves, letting the circumstances that they were written in slip out of our range of view. It may be taken for granted that Shakespeare was indeed influenced by his historical environment, but nobody can say for sure to what extent. What if Shakespeare had lived in ancient Roman times or in the Cold War period? Would he have written different plays? To decide to what extent he was influenced is the task of those scholars who actually do research on the plays. This paper, however, will focus on the actual socio-political, economic, and religious background of Sir William Shakespeare, particularly on the rule of Elizabeth I and James I and on the Elizabethan World Picture with its various manifestations in the English state during Shakespeare’s lifetime. The Tudor era began with a significant event: on August 8, 1485, the troops of King Richard III of the House of York were defeated by the army of Henry Tudor, the Earl of Richmond, who had returned from his exile in France, in the vicinity of the small town of Bosworth, Leicestershire County. For nearly all of the 15th century, the two clans of England’s higher nobility had been struggling for power. Violence, counter-violence, conspiracy and maneuvering had encompassed the kingdom after Henry Bolingbroke (who would later become Henry IV) had driven Richard II off the throne in 1399. During the last years of the struggle that became known as “The Wars of the Roses,” the York family started to fight among themselves. Since the royal court had always been involved in these wars, the conflict consumed a huge part of the national resources, created general instability and, as changing partisanship and political maneuvering became the order of the day, prompted a decline in moral standards. Not only do the five Tudor monarchs who reigned from 1485 till 1603 form a single genealogical line, they’re also a real family with Elizabeth’s life span covering about two thirds of that era. Henry VII marks the beginning of the Tudor dynasty. Having ended the Wars of the Roses and defeated the York family and Richard III at the Battle of Bosworth Field, he immediately and single-mindedly set about to consolidate power in the crown. Henry VIII separated the English church from Roman jurisdiction and founded a national church. As religion and politics were virtually inseparable in the 16th century, the ecclesiastical reforms initiated by Henry VIII had a huge impact on the political landscape. When he assumed the leadership of the English church, he had powers that no other king of England had ever possessed. Henry VIII also closed the monasteries and gave their land to the aristocracy. This course of action naturally ensured that the nobility would support his cause. Not much needs to be said about Edward VI, since he died at the tender age of sixteen. He founded some Grammar Schools and shifted from Henry VIII’s Anglicanism to radical Protestantism. On November 17, 1558, a messenger informed Elizabeth that she had been made queen after the death of her unpopular half-sister. Obviously, the aristocracy was desperate to find a new monarch since Parliament had declared her to be an illegitimate child of Henry VIII when she was three years old. This status was never lifted, but Parliament decided that she was third in the line of succession after Edward and Mary. In 1554, Elizabeth was accused of participating in Wyatt’s Rebellion and was thrown into the Tower of London until she was subsequently pardoned by Mary. Shortly before her death, Mary is said to have recognized Elizabeth as her successor. Extensively educated, Elizabeth was fluent in French, Italian, Latin, and Greek. Upon her enthronement she is said to have personified all the magic of flourishing femininity. She selected men of lower birth to be her advisors, as the old nobility used to be Catholic. The most prominent figure among her staff was William Cecil, a brilliant man of political shrewdness as well as diligence and carefulness. As she was a devout believer in absolutism, Elizabeth did not tolerate criticism. But the people preferred her wise autocracy to the raging madness of the struggling parties of the Wars of the Roses. Her motto became video et taceo (observe and remain silent). Her policy was indeed characterized by hesitation, as she used her virginity as a means of playing with different foreign rulers to gain advantages for her country. Elizabeth was very vain and had alarming manners: She used to hug her courtiers and foreign ambassadors, and there exists today even a rumor that, after he had spent seven years in exile as a punishment for farting in the presence of the queen, when Edward de Vere returned to court, she said to him something to the effect that she had already forgotten about the fart. Elizabeth had the habits of cursing, of laughing loudly, of dancing, gambling, and hunting, and she loved masques and drama. Her power did not consist in logic, but rather in feminine intuition and in being a good observer. She was a role model of vitality, but not of virtue. Elizabeth reintroduced religious reformation to England, but she also represented the Renaissance. Sharing the Machiavellian belief in a more or less unscrupulous leader, she recognized the need for some religion in order to ensure social stability although she personally despised theological dogmas. The queen demanded outer conformity in order to protect the national unity: everybody was allowed to believe what he or she wanted to believe, as long as he or she obeyed the law. By skillfully taking advantage of the conflicts between Spain and France, Elizabeth managed to ward off these outer menaces and gain a period of ten years for England to consolidate politically and economically. The victory over the Spanish Armada in 1588 secured England’s position as a leading Protestant power and the first naval power of the world. A certain dark atmosphere obscured England during the last years of her rule. The people ceased loving her. They felt that she had outlived herself. Her health was deteriorating and Parliament vehemently resisted her attempts to violate parliamentary freedom. Since she hesitated to settle the problem of her succession, Robert Cecil and others secretly entered into clandestine negotiations with James VI of Scotland. Elizabeth died on March 24, 1603. Elizabeth was a symbolic figure. One school of thought has come near to canonizing Elizabeth. According to their view, she was bright, independent, cautious, and able to distinguish the essential from the temporary. She was also circumspect by nature and experience, her prudence deriving from an enormous sense of royal responsibility. She used apparent indecision strategically, to purchase time and to gain advantage from delay. Her negotiation of a via media (a middle way) between Catholics and Protestant reformers was a brilliant act of diplomacy. The disappointments and crises of her reign – the execution of the Scottish queen, the military conflicts in France and the Netherlands, the fierce monetary inflation at the end of the century – all these were probably inevitable, not her fault. The negative complement of this hagiographic approach is the approach that claims the queen was capricious, bull-headed, vacillating, and out of touch with reality. Her uncertainty was a function of monstrous personal vanity, which exaggerated her fear of making a mistake. Her unwillingness to make decisions disabled any attempt at consistent policy; the disappointments and crises of her reign – diplomatic, military, and economic – were all her fault. James VI of Scotland was crowned on July 29, 1567, when he was only thirteen years old. He received a humanistic education, too much instruction in theology and too little in morality, and became the most educated drunkard in Europe. He promised to defend Protestantism. His manners were very brusque, his walking was clumsy, his voice was shrill, his talking was a blend of coarseness and pedantry, but it is said to have at least included some wisdom. A phlegmatic ruler, James liked to rest on Elizabeth’s laurels. He was priggish and generous, shy yet insidious, superstitious, educated, and believed in demons – foolish in some ways and wise in others. Not only did James I demand the entire political power that Henry VIII and Elizabeth had had over their intimidated underlings, but he also claimed a divine and absolutist position. No one has ever described James I as brilliant. It has become permissible and even customary to think of the first Stuart king as a fool. This extreme characterization is probably a result of the gap between his conception of his own talents and achievements and the judgment that history has rendered. His efforts constituted a kind of showboating; in reality James was an indolent, self-satisfied man who preferred to spend the day hunting rather than wrangling over the quotidian details of national policy. In 1581, England’s population was roughly five million. Prices were growing about five times faster than wages. As the living conditions for laborers and craftsmen deteriorated, slums sprang up at the margins of London. Domestic trade was superseded by overseas trading companies such as the East India Company. London became one of the most flourishing economic centers in the world. The economic structure of England was changed profoundly by the discovery and colonization of the American continent. As for economic importance, the Mediterranean was replaced by the Atlantic Ocean. Instead of a marginal position in the geography of the economic world, England now held a very favorable central position. The social system remained intact, but the lively interaction between the classes prevented the sterile shutting-off of individual classes. The existence of a broad and wealthy middle class prevented the emergence of a deep gap between the aristocracy and the poor common people. All the driving forces of this exciting age merge into the „Elizabethan ecstasy.” Conquest, discovery, the wealth of the middle class, theological debates, wide-spread interest in literature and theater, the lasting peace, and the victory over Spain were the seeds that produced Shakespeare. England being threatened by the Catholic nations in Continental Europe created a wave of patriotism. However, rising unemployment and taxes, the war against Spain, and Irish rebels created a situation that sparked criticism of the government and society. The main function of Parliament was not to make policy, but to discuss it; officially it met to authorize taxation and to endorse important acts of state. The Crown retained the right to call the members into session, which it did mainly when it required money or official support for national or international policy; from the Elizabethan era to the outbreak of the English Revolution, the monarchs tended to use Parliament to their own advantage when possible and otherwise to ignore or tolerate it. “William Shakespeare was born into a dying culture.” I, for one, do not think that we can oversimplify the Golden Age to such an extent. Of course, a lot of things were dying in Shakespeare’s England – Catholicism, for example. But on the other hand, as Kastan rightly says, the children of the 1560s built a new Protestant culture on the ruins of the old religion. Thus the order of their society was maintained, rather than left with an empty place where the old traditions had been. A new and flourishing Renaissance culture replaced the old Catholic culture in England, and Shakespeare played a major role in shaping this new culture. The heritage of the Reformation was a new intellectual culture, a revamped political ideology, a reinvented national identity, and a new economic system. As far as concerns the history of Shakespeare’s England, it is not at all unusual that popular and patriotic branches of historiography mystify and glorify this period. What is special about the myth of the Golden Age is its inescapability. On no level of elaboration or professionalism is the depiction of that period able to emancipate itself from myth; there is no distinction made between historical reality and historical myth: they interact at any time and the facts bow to the pattern of the historical myth. This may have changed slightly in the seventies with the rise of “social history”. But instead of reshaping the political picture of the Golden Age, historians instead concentrated on the economic aspects of history, leaving the actual myth intact and adding an intense social criticism. The problem that historians struggle to overcome might be that the political and the cultural heyday of Renaissance England do not concur. The great political achievements occur between the Elizabethan Settlement and the defeat of the Armada; the development of drama reaches the top only after 1588. Due to Elizabeth’s unusually long rule, the foundation for a period of flourishing theatrical culture could be laid. It took decades of continuity for the English self-consciousness to prosper in a way so as to produce Shakespeare’s plays. The Elizabethan Age is a time of upheaval because the world picture of the Middle Ages slowly changes to the world picture of the Modern Times, which means that the notion of a theocentric universe shifts to the idea of a world focused on the human being. The alteration is indicated by three main symptoms: diverging judgments on reality, changing norms of human behaviour and discussions about the human ability to obtain cognition. The consequences of these discussions are many revaluations and turnabouts. A well-known metaphor to describe Elizabethan times is the one of “the world upside down”. Tillyard describes the Elizabethan age as a time of two contradictory principles: on the one hand the faith in humanism and the present life and on the other hand the belief in an afterlife refusing the presence because of secular ruin. The first important aspect to mention about the Elizabethan Age, however, is the fact that the changes of that time did not influence the world picture. But, what is a “world picture”? How is the term defined? According to Ulrich Suerbaum, a “world picture” is a complex of ideas, convictions and principles that are known and accepted by all contemporaries. But, it is not the result of what an epoch knows or thinks to know about the world, it is rather a system of categories and notions to perceive the world. This common apprehension was shared by all Elizabethans and may therefore be called the “Elizabethan World Picture”. Uwe Baumann remarks that even if the Shakespearian Age shows differences of opinion concerning all spheres, the world picture is based on a consensus of notions to explain the perceptible reality. In this context Baumann agrees with Suerbaum: “Dieses Weltbild dient als Rahmen, in den der Einzelne verschieden viele und verschieden differenzierte Detailkenntnisse und -meinungen einordnen kann”. This opinion modifies Tillyard’s synthetic view of the Elizabethan world picture. Consequently, Baumann stands for a modified understanding of the term “world picture”. W. R. (real name?) Elton mainly concentrates on the diverse features of the world picture in Shakespeare’s times, which comprise diversity, variety, inconsistency and fluidity. Moreover, he focuses on the three main principles: the frame of order, the great chain of being and the hierarchy within the system. Now if nature should intermit her course and leave altogether, though it were but for a while, the observation of her own laws; if those principal and mother elements of the world, whereof all things in this lower world are made, should lose the qualities which now they have…what would become of man himself, whom these things now do all serve? See we not plainly that obedience of creatures unto the law of nature is the stay of the whole world? Tillyard, Suerbaum and Baumann agree on the opinion that people at the time believed in a universe created by God who gave every creature, from the low minerals up to the archangels, its unique place within an all-embracing hierarchy, which was subdivided in “degrees”. Additionally, Elton mentions that every creature has received its unique place from God in accordance with its distance from divine perfection. At this point it is worth having a look at Suerbaum’s and Baumann’s comments on the Elizabethan world order. In contrast to Tillyard, who calls the predominant idea “a general conception of order”, Suerbaum and Baumann consider it to be a “frame of order”, which firstly is the basis for all sciences, secondly includes material and mental nature and thirdly unites both past and present phenomena. However, all three support the assumption that the unity of the cosmos springs from God. This also means that all Elizabethans thinking about the concept of their world simultaneously sense religious connotations. Whereas both Tillyard and Suerbaum talk about a conception, a system or a frame of order, Russ McDonald calls it an “ideology of order”. According to him, the theory of a universal organization, which is handed down by religious and political thinkers of the Middle Ages, in connection with the belief that God created the universe allotting one certain place for everyone and everything, is the precondition for a harmonic and productive society. Therefore order and hierarchy prove to be useful for both Elizabeth’s and James’ government. According to McDonald this is enough evidence to call the Elizabethan world order not only a “doctrine” but also rather an “ideology”. To put it in a nutshell, the meaning of order in Elizabethan times is the notion of a system, which is based on God as the source, including material and mental nature and uniting past, present and future phenomena. McDonald’s argumentation is problematic because the theory of a universal organization cannot only be passed on by religious and political thinkers of the Middle Ages, but also by ordinary people. In this context Tillyard remarks that the “conception of order…must have been common to all Elizabethans of even modest intelligence.” Therefore ideas also have to be handed down by average people. Thus, the Elizabethan world picture is not a set of beliefs, mainly political ideas on which people, parties or countries base their actions, but a system of notions – not based on knowledge- people have in the Elizabethan Age. The most common idea every Elizabethan agreed on is the hierarchical system within a frame of order created by God who allotted one unique place to each creature of the cosmos. The following description of the macrocosm may be considered to be the best known universal concept in Elizabethan times. According to this idea heaven and the macrocosm consisting of the stars and their spheres are located above the moon. People thought of the universe as a system of concentric circles with the elemental area in the centre. The globe is made of the two heavy elements of soil and water and the two light elements of air and fire in form of ether, which makes up the atmosphere. With the moon as the first element of the macrocosm the spheres or the so-called heaven of the seven planets begins, which were, in Elizabethan Age, apart from Luna, Mercury, Venus, Sol, Mars, Jupiter and Saturn. In this context Tillyard adds that everything beneath the sphere of the moon is characterized by mutability and the rest of the cosmos by constancy. The eighth sphere is the starry sky with the stars and the signs of the zodiac, which are reflected in the translucent ninth heaven, the Coelum Cristallum. The tenth heaven, the so-called Primum Mobile with which God moves the whole system, holds the universe together. And finally the eleventh sphere, the Coelum Empyraeum, God lives in with the blessed ones and the nine angel choirs. Apart from that, the movements of all stars are tuned and therefore music of the spheres is produced, which is supposed to be the epitome of harmony. But since mankind’s original sin human beings are unable to hear the music of the sphere. Although the belief in a universe with the earth in its centre shifted to the faith in a system in which the sun is the focus, the notion of the macrocosm described above hardly changed. The reason for this is that the sun has always been a special planet and the earth did neither lose its significance nor its unique character. Apart from that, heaven eight to heaven eleven are no longer separated, but both the starry sky and the home of the blessed ones are regarded to be one sphere. Angels, as God’s messengers, however, were thought to inhabit the whole range of the cosmos. To sum up, Elizabethans had a very concrete idea of how the universe above the moon was constructed. Despite the major change from the earth as the focal point to a system in which the sun was in the center, the Elizabethan notion of the macrocosm kept its stability. The best-known pictures to explain the hierarchical world order were both “the chain of being” and the “scale of degree”. Moreover, the universe as a musical composition, as an organ with registers or as a stringed instrument were also common images of explanation. Additionally, Suerbaum mentions that each link is unique because of its place in the chain. As a link it is similar to many other links, but as soon as one component is missing, the chain is unable to keep up its full function. To sum up, Tillyard presents an Elizabethan notion of the world in which nature is linked through a hierarchical chain. The corresponding moment of all different classes, however, is the aspect of a primate in every class of creatures. Apart from the chain of being, the stairs are a well-known metaphor to explain God’s hierarchical order of the universe. The most famous illustration of the cosmos beneath the moon – which means that the spheres above the moon are excluded – is the diagram by Bovillus (de Bouelles) from 1509: The first step of the stairs represents the realm of the minerals, like rocks, of which pure existence is the only feature. The second step symbolizes the domain of the Vegetable Kingdom, which includes trees for example, and which is characterized by existence and life. Existence, life, sentiment and motion are distinct attributes for creatures of the Animal Kingdom, which is on the third step of the stairs. The last and highest step of the earthly sphere is taken by the human being who possesses, in addition to the features of a member of the Animal Kingdom, intellect and a soul. On the right side of the illustration the stairs lead downwards again. On top of the upper step a scholar, as the crown of the earthly hierarchy, is studying his books. Virtue is his characteristic feature. But, the human being has no reason to be arrogant because he is able to descend through his own fault. The vain human being sitting on the second step is compared to the members of the Animal Kingdom because he suffers from hedonism, which is a reprehensible sin. Analogous to vegetable life the human being perching on the third step is addicted to feasting. As gluttony is his vice, he had to descend the ladder. On the lowest step of the ladder, analogous to the minerals and with the feature of pure existence, a man is crouching down without doing anything. He is guilty of sluggishness, which is also a deadly sin. The diagram just comprises the earthly spheres because only the elemental cosmos beneath the moon is exposed to alteration and death. The reason for change and the extinction of life is the fact that the earthly spheres consist of all four elements of water and soil, fire and air. To sum up it can be said that the stairs, which are representing the transient spheres, symbolize an order in which all living creatures are separated into hierarchical classes. These classes on one side of the illustration are compared to the human being and his vices on the other side of the diagram. Some human beings belong to a lower class than others dependent on their sin of hedonism, gluttony or sluggishness. In this passage Pierre de la Primaudaye chooses the man’s body, the house and the body politic as examples of correspondences within the hierarchical system of Elizabethan times. Although the extract shows to be different from the first quote, it underlines the analogy Elizabethans also believed in: the similarity between the planets and the ages of all human beings. In this context Elton mentions that the analogical conception of the world that relates God and the human being was handed down from the Middle Ages. Elizabethan times, however, knew a simplified version of the analogical world picture present in the middle Ages. The extracts and Tillyard’s remark explain how Elizabethans, with the help of images, drew parallels between the outer space, nature, society and themselves as parts of an organized world. In addition to Tillyard’s point of view, scholars today still agree on the fact that everyone at the time gave credence to these correspondences. Moreover, people believed that God created the human being as the last and most perfect creature on earth. Another quotation from Sir Walter Raleigh underlines that mankind is the mirror and the model of the whole creation: “Man, thus compounded and formed by God, was an abstract or model, or brief story of the universal”. Mankind is supposed to rule the earth and its creatures while glorifying the world’s creator. CHOLERIC MAN hath nature of FIRE, hot and dry, naturally is lean and slender, covetous, ireful, hasty, brainless, foolish, malicious. He hath wine of the LION: he chideth, fighteth and commonly he loveth to be clad in black. SANGUINE MAN hath nature of AIR, hot and moist. He is large, plenteous, attempered, amiable, abundant in nature, merry, singing, laughing, liking, ruddy and gracious. He hath his wine of the APE: more he drinketh the merrier he is and draweth to women, and naturally loveth high coloured cloth. PHLEGMATIC MAN hath nature of WATER, cold and moist. He is heavy, slow, sleepy, ingenious, commonly he spitteth when he is moved, and hath his wine of the SHEEP, for when he is drunken he accounteth himself wisest, and loveth most green colour. Analogous to the superior position of the sun, the king likewise plays the main part in society. As God’s representative on earth he is positioned on top of all worldly hierarchies. God made all the parts of the body for the soul and with the soul to serve him, and all the subjects in a kingdom to serve their king and with their king to serve him. If the head of the body ache, will not the heart be greatly grieved, and every part feel his part of the pain of it? And shall a king in his will be displeased and the heart of his kingdom (the hearts of his subjects) not have a feeling of it? Can the eye of the body be hurt or grieved, and neither the head heart nor any other member be touched with the pain of it? No more can the council, the eye of the commonwealth, be disturbed, but the king will find it and the commonwealth will feel it. Can the hand, the artificer, be hurt but the commonwealth will find the lack of it, the eye with pity will behold it, and the head with the eye, the king with the council, take care for the help of it? Can the labourer, the foot, be wounded, but the body of the state will feel it, the head be careful, the eye searchful and the hand be painful in the cure of it? And can the commonwealth, the body, be diseased, but the king, his council and every true subject will put to his hand for the help of it? To sum up, the Elizabethan idea of the body politic is a conception in which the ruler is the head of the state, comparable to the sun as the ruler of heaven. As there is a king in all positions of both the macrocosm and the microcosm, monarchism is thought to be the natural form of government in Shakespeare’s time. Moreover, disorder in nature and indisposition of the sovereign are the greatest threats to the stability of the body politic. According to Tillyard it is the great achievement of the Middle Ages on the one hand to regard the world with this double vision and on the other hand to draw the conclusion that the present decay is a consequence of sin. To put it in a nutshell, the meaning of sin at Shakespeare’s time was present in everyday life because people considered themselves living in an insecure world that, however, was not lost because of God’s presence and his providence in the existence of nature. The present paper tried to approach the Shakespearian global concept by analyzing the Elizabethan world picture and its characteristics. Apart from that controversial opinions were as far as possible also taken into consideration. In retrospect the Elizabethan Age is a time of revaluations and turnabouts in which mankind both had faith in the present life and – in contrast to that – in an afterlife refusing the present time because of secular ruin. In this context people talk about the Elizabethan World Picture, which, according to Suerbaum, is a system of categories and notions to perceive the world. The important aspect is that all Elizabethans shared this specific system of categories and ideas and therefore we may talk about the Elizabethan World Picture. In this context Baumann agrees with Suerbaum and, moreover, supports a modified understanding of the term “world picture”. The next aspect of interest is the importance of order: People in Shakespearian times gave credence to a hierarchical system within a frame of order created by God who assigned one unique place to every creature in the universe. The cosmos at the time was a complex in which the earth was the focus. The moon was the first planet to be thought part of the heaven of the seven planets. Above this sphere was the starry sky with the stars and the signs of the zodiac. The ninth heaven was considered to be translucent. The whole system could be moved by God with the help of the Primum Mobile. Heaven eleven, finally, was regarded as the home of God, the blessed ones and the nine angel choirs. Although the idea of a complex in which the sun is the center became predominant in the course of the Shakespearian time, the Elizabethan notion of the macrocosm kept its stability. Apart from that the Chain of Being and the stairs are significant characteristics of the Elizabethan World Picture. Tillyard mentions that people at the time gave credence to a world in which all parts of nature are linked through a hierarchical chain. Moreover, the stairs symbolize an order in which all creatures are separated into hierarchical classes. In this context mankind is also classified according to his sins. Besides, analogy and correspondences are very central characteristics of the Shakespearian global concept, too, because all Elizabethans believed in correspondences and drew parallels between the outer space, nature, society and themselves as parts of an organized world. The human being was regarded as a connection between mortal and immortal world and a replica of the entire creation. People at the time thought to know four types of personality. The last two aspects of importance are the body politic and the meaning of sin. The ruler was regarded as head of the state and monarchy considered to be the natural form of government. Disorder in nature and indisposition of the sovereign were the greatest threats to the establishment of the body politic. Sin was present in everyday life because people saw themselves living in an insecure world that, however, was not lost because of God’s presence and providence in the reality of nature. This paper has made an effort to approach the Elizabethan Age from the fact-based point of view of an historian as well as from an anthropological perspective that concentrates more on vaguer ideas and concepts of the time and the religious and/or pseudo-religious mindset of the people. We find that the historical events as well as the data about the Elizabethan World Picture gathered above provided a more then ample background that Shakespeare could rely on when creating his plays. Again, to what extents plots, sub-plots, characters, single scenes or lines are influenced by those will most likely never be completely extrapolated. But the general influence is undeniably to be found in Shakespeare’s works and we hope that our humble compilation will enable the reader to understand more about the background (or the foreground?) that shaped the plays of Sir William Shakespeare. Baumann, Uwe. Shakespeare und seine Zeit. Stuttgart: Ernst Klett Verlag, 1998. Durant, Will and Ariel. Kulturgeschichte d. Menschheit Vol. 10: Gegenreformation und elisabethanisches Zeitalter. München: Südwest, 1978. Kastan, David S. A companion to Shakespeare. Oxford: Blackwell, 2000. McDonald, Russ. The Bedford Companion to Shakespeare: An Introdcution with Documents. Boston: Bedford, 2001. Muir, Kenneth. A new companion to Shakespeare studies. Cambridge: CUP, 1980. Schabert, Ina. 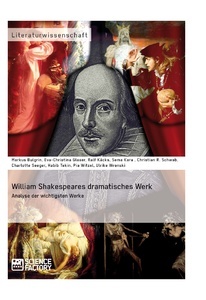 Shakespeare-Handbuch: die Zeit, der Mensch, das Werk, die Nachwelt. Stuttgart: Kröner, 1978. Sinclair, John, ed. PONS Cobuild: English Learner’s Dictionary. Glasgow: Omnia Books Limited, 1996. Suerbaum, Ulrich. Das elisabethanische Zeitalter. Stuttgart: Reclam, 1989. Tillyard, E. M. W. The Elizabethan World Picture. London: Chatto & Windus, 1943. Mit diesen Worten endet Shakespeares “Most Excellent and Lamentable Tragedy of Romeo and Juliet”. Es wird die beklagenswerte Geschichte einer Liebe erzählt, die auf Grund eines Familienzwists und einiger Zufälle tragisch endet. Eine Geschichte voller Leid, so wie man es aus einer klassischen Tragödie kennt. Doch bei Shakespeares „Romeo and Juliet“ hat man es nicht mit einer gewöhnlichen Tragödie zu tun. Sie wird zwar im Titel als Tragödie deklariert, birgt aber doch gerade im ersten Akt zahlreiche komische Elemente, die für eine Tragödie doch recht ungewöhnlich sind. Von dieser Besonderheit ausgehend, stellt sich die zentrale Frage dieser Ausarbeitung: Welches Verhältnis haben die komischen und die tragischen Elemente in Shakespeares „Romeo and Juliet“ zueinander? 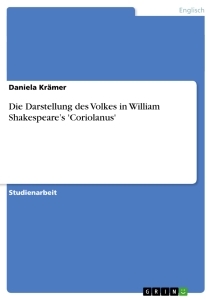 Daher wird zunächst das typisch Komische zur Zeit Shakespeares dargestellt. 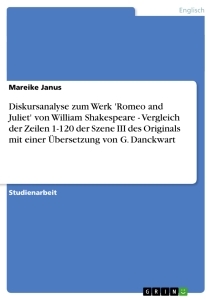 Es sollen Einflüsse traditioneller, beziehungsweise zeitgenössischer Werke herauskristallisiert werden, um diese später in der Analyse der komischen Aspekte in „Romeo and Juliet“ wieder aufzugreifen und zu verwerten. Daraufhin sollen im nächsten Teil die besonderen Merkmale der elisabethanischen Tragödien beschrieben werden. Daran wird sich die Analyse der tragischen Aspekte aus „Romeo and Juliet“ anschließen. Dabei soll untersucht werden, inwiefern diese dem typisch elisabethanischen Tragödienverständnis entsprechen oder aber davon abweichen. Abschließend soll nun im Fazit das Verhältnis der tragischen und komischen Elemente des Werks aufgezeigt werden. Was macht das ganze Werk nun zu einer Tragödie, wo doch ein großer Teil auf komischen Elementen basiert? Was bewirkt diese Art von Mischform? Wie wirken die beiden unterschiedlichen Elemente der Tragödie und der Komödie in einem Werk vereint und was lässt sich aus dieser Analyse auf die Dramenintention schließen. William Shakespeare war zu seiner Zeit nicht nur ein begnadeter Tragödiendichter, auch seine Komödien waren allseits beliebt und gern gespielt. Die Tradition des Komischen selbst gehört zu den ältesten des englischen Theaterwesens. Die elisabethanische Komödie fand ihren Ursprung in volkstümlichen Interludes, lustigen Szenen mit komischen und lächerlichen Figuren, die während der mittelalterlichen Mysterienspiele als Pausenfüller dienten. Wegen ihrer Aufführungsform sprachen diese mehr die unteren Volksschichten an. 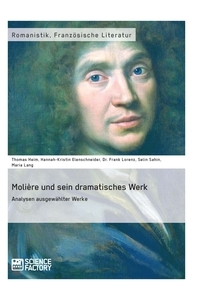 Zu einer selbständigen Kunstform entwickelte sich die Komödie erst unter dem Einfluss römischer Dichter, wie Titus Maccius Plautus und Terenz (Publius Terenzius Afer), die im Lateinunterricht der Schulen und Universitäten unterrichtet und auch aufgeführt wurden. Zugänglich waren diese jedoch nur für die oberen Schichten, die sich einen solchen Bildungsweg leisten konnten. Die Figuren sind alle nach zeitlosen Verhaltensmustern entworfen, wie zum Beispiel dem geizigen Vater oder dem listigen Diener, außerdem verweisen auch Form und Handlung stark auf die römischen Vorbilder. 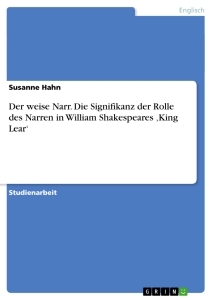 Rein inhaltlich war die plautinische Liebeskomödie ein Vorbild für Shakespeare: Ein junges Liebespaar, dessen Beziehung von der Gesellschaft nicht gestattet wird, schafft es nach vielen Verwicklungen und trotz aller liebesfeindlicher Normen ihre Liebe durchsetzen und krönt diese mit einer Hochzeit. Die Vertreter der Gesellschaft werden lächerlich gemacht, und sie erkennen die Fehler ihrer eigenen Normen und akzeptieren das Liebespaar nun offiziell. Die aus Italien stammende „Commedia dell’Arte“, die etwa in der Mitte des 16. Jahrhunderts herum entstand, wird ebenfalls als großes Vorbild der komischen Tradition Englands begriffen. Improvisation und Wortwitz ersetzten aufgeschriebene Spieltexte, zudem traten immer feste Bühnentypen auf. Vor allem die für diese Komödienform typische Situation des Werbens mehrerer Männer um eine Frau wurde von Shakespeare und seinen Zeitgenossen gerne verwendet. Unter den obengenannten zahlreichen Einflüssen entwickelte sich eine eigene, für sich stehende Gattung. Die elisabethanischen Komödien basieren alle auf der Forderung, dass die Komödie nicht nur belustigen, sondern auch eine Bildungsfunktion beinhalten solle. Durch die komisch-satirischen Elemente soll ein einfacherer Zugang zur eigentlichen Intention eines Stückes ermöglicht werden. In der Komödie wird ein Abbild des normalen Lebens projiziert, nicht eines des hohen Lebens, wie in der Tragödie. Die Handlung spielt sich mehr im privaten Bereich ab und thematisiert Stoffe der Gegenwart im Gegensatz zur Tragödie, in dem der „Fall of Princes“, also der Fall eines hochrangigen Menschen einer vergangenen Zeit, behandelt wird. 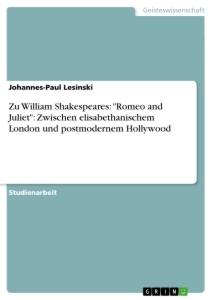 Die Quellen Shakespeares, wie diejenigen zu „Romeo and Juliet“, sind typisch novellistischen Ursprungs und weniger bekannte historische Geschichten. „Romeo and Juliet“ beinhaltet ein doch sehr zeitloses Thema, dass weniger politische als private Probleme anspricht. Shakespeare platziert „Romeo and Juliet“ inhaltlich in eine typisch komische Situation, wie in den bereits in Abschnitt zwei genannten plautinischen Komödien: Zwei Liebende müssen soziale und politische Hindernisse überwinden, um wieder vereint zu sein. Ein starker Einfluss auf Shakespeare scheint dabei auch von den für die elisabethanische Zeit typischen romanesken Komödien auszugehen, die den gleichen Stoff behandelten. 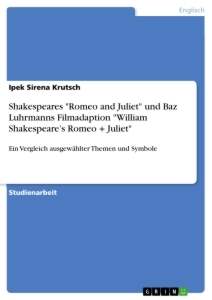 Die Liebe von Romeo und Juliet wird beispielsweise mit der Metapher eines Seeabenteuers verglichen, ein typisches Motiv elisabethanischer Komödien. Mit Glück und Geschicklichkeit schafft es das Paar natürliche Hindernisse zu umschiffen, um am Ende zusammen sein zu können. Das Thema Liebe ist in Shakespeares komischem Werk omnipräsent. Nach seiner Auffassung zeigt die Darstelllung des Liebespaares die Schwäche eines Menschen und die daraus entstehenden Schwierigkeiten, die er mit seiner Identität und seinem Verhältnis zu anderen hat. Auch die Identitätsproblematik findet sich in „Romeo and Juliet“ wieder. Jeder der Liebenden hadert mit sich und der Herkunft des anderen, die einen Keil zwischen sich selbst und den geliebten Menschen treibt. „My only love, sprung from my only hate! Auffallend ist ebenfalls, dass die Liebe in den elisabethanischen Komödien durch die Bräuche romantischer, petrarkistischer Liebesdichtung idealisiert wird. Diese Blindheit der Liebe wird oft ins Lächerliche gezogen, denn diese Art der Werbung betont in der elisabethanischen Sichtweise, dass die männliche Dominanz außer Kraft gesetzt wird. Der Mann ist der Bittende und wird von seinem Gefühl beherrscht. In genau diesem Muster verhält sich auch Romeo, als er zu Beginn des Stückes noch Rosaline verfallen ist: Er wird von dieser nicht erhört, himmelt sie aber weiterhin an und lamentiert ganz im Stil petrarkistischer Dichtung über sein Unglück. Auf Benvolios Drängen hin begibt er sich mit auf das Fest der Capulets, der festen Überzeugung, nie wieder eine Andere lieben zu können. Doch es kommt, wie es kommen muss, er verliebt sich dort unsterblich in Julia – Rosaline ist vergessen. „Did my heart love till now? Forswear it, sight! Eine unmögliche Liebe wandelt sich beim Blick auf Juliet zu einer möglichen, wieder typisch für die shakespear’sche Komödie. Ein Handlungsstrang, der im Verlauf dann, nach einigen Abenteuern und Hindernissen zu Vereinigung der wahren Liebenden führen soll. Das Verona, in dem die Fehde zwischen den Capulets und den Montagues stattfindet, ist der typische Startpunkt einer Komödie. Man wird gleich zu Beginn mit einer Gesellschaft konfrontiert, die von Bräuchen, ritualen Bindungen, tyrannischen Gesetzen und älteren Charakteren bestimmt ist. Die Fehde ist mehr ein mechanischer Reflex als tiefer Hass, der im Prolog so ominös beschrieben ist, aber als humoristisches Element präsentiert wird: Die Dienerschaft der beiden Häuser provoziert sich gegenseitig mit obszönen Wortspielen und zwei alte Herren geifern nacheinander und die Frauen müssen sie zurück halten. Dies wird in vielen shakespear’schen Komödien als Spannungselement benutzt. Die Fehde der Eltern ist das Hindernis, dass von außen auf die Liebenden einwirkt und welches sie überwinden müssen. Die Komödie beinhaltet stets die Möglichkeit Gesetze und Situationen zu umgehen, sie basiert auf dem Prinzip der Ausweichlichkeit. Dies birgt einen großen Handlungsspielraum und die Möglichkeit für ein „gutes Ende“. Für die Geschehnisse ist immer unbegrenzt Zeit vorhanden. Doch das Timing selbst muss dabei immer stimmen. Das gefährliche Abenteuer des Scheintodes und versprochener Wiederauferstehung beispielsweise, ist eine der ältesten und beliebtesten komischen Traditionen der englischen Bühnengeschichte. Shakespeare benutzt den Scheintod in zahlreichen Komödien, dabei werden Werte und Ausdauer der Heldin getestet und schließlich führen Glück und gute Eigenschaften immer zur Rettung. Die List der jungen Liebenden gegenüber den Eltern ist ein traditionelles Motiv der Renaissancekomödie. 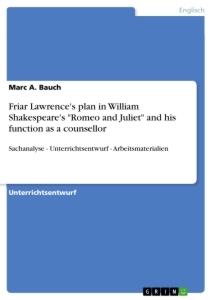 Auch bei „Romeo and Juliet“ besteht bis zum Tode Romeos noch die Hoffnung, dass Friar Laurence rechtzeitig erscheint, die Möglichkeit für ein glückliches Ende besteht also, doch stimmt in diesem Falle das Timing nicht, was zu einem tragischen Ausgang führt. Die Charaktere von „Romeo and Juliet“ gehören entweder dem niedrigen Adel oder deren Dienerschaft an. Diese sind nicht mit Kriegen und Politik, sondern eher mit Feierlichkeiten und dem Haushalt beschäftigt. Shakespeare setzt traditionelle Figuren ein, deren Beziehungen zueinander schon potentiell komisch sind: Das junge Paar, das sich entgegen aller sozialer Hindernisse ineinander verliebt, der halsstarrige, uneinsichtige Vater, die überfürsorgliche und geschwätzige Amme und der weise, manipulative Priester. Die beiden Liebenden sind nach typisch komischem Muster gestrickt. Romeo, ein eleganter junger Mann aus gutem Hause, verträumt und unsterblich in eine Frau verliebt, die unerreichbar für ihn ist. Auf einem Fest verliebt er sich auf den ersten Blick in die Tochter der konkurrierenden Familie und schwört dieser bis an sein Lebensende Treue. Juliet ist wunderschön, keusch und umworben von zahlreichen Männern. Es scheint, als habe sie etwas von der Charakterstärke der komischen Heldinnen in Shakespeares Komödien, die selbst die Fäden in die Hand nehmen. Die Frauen emanzipieren sich und sind oft handlungsbestimmend. Juliet ist realitätsnah und weiß was sie will. Sie möchte sich beispielsweise nicht von Romeo in das petrarkistische Frauenbild erheben lassen und hält ebenfalls nichts von romantischen Schwüren, die ebenso leicht wieder gebrochen, wie ausgesprochen werden können. Sie denkt pragmatisch und treibt die Handlung in Richtung Hochzeit an. Ihre Charakterstärke wird nur überschattet von ihrer späteren Abhängigkeit zu Friar Laurence. Dieser ist eine weise und wohlwollende Figur, die mit ihren manipulativen Mitteln versucht eine unlösbare Verbindung zwischen Romeo und Juliet zu erschaffen, um die Feindschaft der Familien zu beenden. Bei Laurence findet man Religiosität gepaart mit den Zügen eines Magiers. Solche Figuren findet man normalerweise nur in der Komödie, in der die Zukunft offen und veränderbar ist. Er ist eine in sich ruhende Person, die ihre Zeit benötigt, um alles zum Guten zu wenden. In der Komödie schafft es der Manipulator stets sein Ziel zu erreichen, weil für die Ereignisse in der Komödie unbegrenzt Zeit vorhanden ist und das Timing stimmt. Doch schafft es der Friar nicht, seine komischen Ursprünge zu vollenden. Juliets Amme gehört ebenfalls zum komischen Personal. Sie ist eine geschwätzige Kupplerin und allein ihre deftige, prosaische Sprache erinnert an die volkstümliche Komödie des elisabethanischen Zeitalters. Ihre Hauptbeschäftigung sind Haushalt und Erziehung. Sie sieht keine besondere Dringlichkeit in den Dingen, das einzig Wichtige scheint die Hochzeit ihres Schützlings zu sein – egal mit wem. Auch hier ist das typisch komische Element des Gemächlichen erkennbar, die Schwatzhaftigkeit und die Gemütsruhe der Amme deuten auf die unlimitierte Zeit der Komödie hin. Mercutio stellt den typischen Clown der romantischen Komödie dar. Mit seinen eleganten, geistreichen Wortspielen hebt er sich aus der Handlung hervor, um die idealistische Liebe mit seiner eigenen komischen weltlichen Gesinnung zu erklären. „Romeo! Humours! Madman! Passion! Lover! Cry but ‘Ay me!’ Pronounce but ‘love’ and ‘dove’. Hier stellt er beispielsweise die Liebe als bloßes Klischee dar und macht sich durch den Vergleich Romeos mit dem halbblinden Cupido über Romeos blinde, bedingungslose Schwärmerei lustig. Mit seinem unendlichen Einfallsreichtum, seiner Vitalität und den daraus resultierenden schnellen Zügen und Gegenzügen innerhalb seiner Wortspiele, liefert er Alternativen zum tragischen Verlauf: Er ist nicht an Ereignisse gebunden, sie dienen ihm höchstens als Verbindung für seine Witze und er ignoriert jede Art von Dringlichkeit. Diese alternative Sichtweise, sowie das Element von Freiheit und Spiel sterben mit Mercutio zu Beginn des dritten Aktes. Die elisabethanischen Dramen haben in ihrer Erfolgsgeschichte eine lange Entwicklungsphase hinter sich. Die einheimische Tradition des Volksschauspiels mischte sich mit den Einflüssen des lateinischen Dramas, woraus eine Fülle von Handlungsmustern und Präsentationsformen entstehen konnte. Wichtigstes Element einer Tragödie ist für die Elisabethaner der sogenannte „Fall of Princes“. Dieser Begriff geht auf die Tragödienkonzeption des Mittelalters zurück: Aus den damals üblichen Handlungssträngen der „de casibus“-Tragödien, entwickelt sich dieses neue Konzept. Prägende Beispiele dafür sind vor allem von Chaucer und Boccaccio, für die Tragödien Erzählungen sind, die vom Sturz eines Menschen aus Macht, Glück und Reichtum in Elend, Armut und Tod berichten. Verantwortlich für den Fall ist Schicksalsgöttin Fortuna, die mit ihrem Werkzeug und Symbol, dem „wheel of fortune“ einem Menschen nach oben hilft, ihn aber auch schnell wieder nach unten bringen kann. Fortuna fungiert als Werkzeug göttlicher Gerechtigkeit: Die Großen fallen nur, wenn sie Schuld auf sich geladen haben. Dahingehend wird die mittelalterliche Konzeption durch eine didaktisch-moralische Funktion erweitert, denn die reinigende Wirkungsabsicht der Katharsis kennt die Tragödie des Mittelalters noch nicht. Fortuna wird oft auch als blinde Gewalt dargestellt, die aus reiner Willkür Menschen zu Fall bringt. Ein großer Einfluss geht aber auch von den römischen Tragödien aus, die grundsätzlich auf den antiken Traditionen der aristotelischen Poetik basieren. Vor allem von Seneca lernen die englischen Dramatiker formale und sprachliche Techniken und lassen sich von den zum Teil sensationell-leidenschaftlichen Themen, wie Ehebruch, Kindsmord oder Inzest inspirieren. Typische Elemente dieser Tragödien sind Geistererscheinungen und Botenberichte, sowie die stichomythischen Dialoge, die vor allem auch Shakespeare gerne benutzte. Sie wurden aber weniger zur Aufführung, sondern viel mehr zum Lesen verfasst, mussten also für die Dramatisierung von den englischen Nachahmern etwas modelliert werden. So wurden komische Einlagen eingefügt, woraus sich dann zahlreiche dramatische Mischformen ergaben. Bei der Gestaltung einer elisabethanischen Tragödie wurde dem Schriftsteller insgesamt viel Flexibilität und Freiraum gelassen. Der Grundtyp der Tragödie besteht aus einem Sturz aus sozialer Höhe mit tödlichem Ausgang, wovon ausgehend nun mehrere Varianten möglich waren: Die Figuren können auch niedriger situiert sein und die Handlung kann sich sowohl in einer privaten, als auch in einer öffentlichen Sphäre abspielen. Ebenfalls variabel lässt sich die Frage nach Schuld und Moralität des Helden stellen. Den elisabethanischen Schriftstellern gelang es dabei stets die vorbildliche Tragödienform der römischen Antike mit der eigenen volkstümlichen Tradition kunstvoll zu vereinigen. Shakespeare experimentierte zu Beginn seiner Karriere oft mit verschiedenen Dramenformen, eines der Ergebnisse ist die Tragödie von Romeo und Julia. Ulrich Suerbaum, Das elisabethanische Zeitalter, Stuttgart: Reclam (1989), 38-40. Russ McDonald, The Bedford Companion to Shakespeare: An Introduction with Documents, Boston: Bedford (2001), 303. Ina Schabert, Shakespeare-Handbuch: die Zeit, der Mensch, das Werk, die Nachwelt, Stuttgart: Kröner (1978), 4. Kenneth Muir, A new companion to Shakespeare studies, Cambridge: CUP (1980), 169. David S. Kastan, A companion to Shakespeare, Oxford: Blackwell (2000), 25. Uwe Baumann, Shakespeare und seine Zeit, Stuttgart: Ernst Klett Verlag (1998) 7. Kenneth Muir and Samuel Schoenbaum (1980), A New Companion to Shakespeare Studies, Cambridge: Cambride University Press (1980) 180. E. M. W. Tillyard, The Elizabethan World Picture, London: Chatto & Windus (1943) 2. Ulrich Suerbaum, Das elisabethanische Zeitalter, Stuttgart: Reclam (1989) 475. E. M. W. Tillyard, The Elizabethan World Picture, London: Chatto & Windus (1943) 7. E. M. W. Tillyard, The Elizabethan World Picture, London: Chatto & Windus (1943) 8. Thomas Elyot, The Book named the Governor, cited in: E. M. W. Tillyard, The Elizabethan World Picture, London: Chatto & Windus (1943) 9. E. M. W. Tillyard, The Elizabethan World Picture, London: Chatto & Windus (1943) 11. E. M. W. Tillyard, The Elizabethan World Picture, London: Chatto & Windus (1943) 13. E. M. W. Tillyard, The Elizabethan World Picture, London: Chatto & Windus (1943) 13-14. Ulrich Suerbaum, Das elisabethanische Zeitalter, Stuttgart: Reclam (1989) 479. Kenneth Muir and Samuel Schoenbaum (1980), A New Companion to Shakespeare Studies, Cambridge: Cambride University Press (1980) 182. Ulrich Suerbaum, Das elisabethanische Zeitalter, Stuttgart: Reclam (1989) 478. Russ McDonald, The Bedford Companion to Shakespeare, Boston: Palgrave (2001) 319. Russ McDonald, The Bedford Companion to Shakespeare, Boston: Palgrave (2001) 320. John Sinclair, ed., PONS Cobuild: English Learner’s Dictionary, Glasgow: Omnia Books Limited (1996) ?? E. M. W. Tillyard, The Elizabethan World Picture, London: Chatto & Windus (1943) 35. Ulrich Suerbaum, Das elisabethanische Zeitalter, Stuttgart: Reclam (1989) 480. Ulrich Suerbaum, Das elisabethanische Zeitalter, Stuttgart: Reclam (1989) 484. E. M. W. Tillyard, The Elizabethan World Picture, London: Chatto & Windus (1943) 36-37. Ulrich Suerbaum, Das elisabethanische Zeitalter, Stuttgart: Reclam (1989) 485. E. M. W. Tillyard, The Elizabethan World Picture, London: Chatto & Windus (1943) 23. Ulrich Suerbaum, Das elisabethanische Zeitalter, Stuttgart: Reclam (1989) 486. Uwe Baumann, Shakespeare und seine Zeit, Stuttgart: Ernst Klett Verlag (1998) 8. Uwe Baumann, Shakespeare und seine Zeit, Stuttgart: Ernst Klett Verlag (1998) 9. E. M. W. Tillyard, The Elizabethan World Picture, London: Chatto & Windus (1943) 79. Ulrich Suerbaum, Das elisabethanische Zeitalter, Stuttgart: Reclam (1989) 492. Uwe Baumann, Shakespeare und seine Zeit, Stuttgart: Ernst Klett Verlag (1998) 10. Ulrich Suerbaum, Das elisabethanische Zeitalter, Stuttgart: Reclam (1989) 493. E. M. W. Tillyard, The Elizabethan World Picture, London: Chatto & Windus (1943) 55. Ulrich Suerbaum, Das elisabethanische Zeitalter, Stuttgart: Reclam (1989) 494. Homily of Obedience in book of Homilies from 1547, zitiert bei Tillyard. Shakespeare, Troilus and Cressida, I, iii, 89-94. Uwe Baumann, Shakespeare und seine Zeit, Stuttgart: Ernst Klett Verlag (1998) 11. Shakespeare, Troilus and Cressida, I, iii, 94-101. E. M. W. Tillyard, The Elizabethan World Picture, London: Chatto & Windus (1943) 18-20. Shakespeare, William: Romeo and Juliet. Hg. v. Herbert Geisen. Stuttgart : Reclam, 2009. (Reclams Universal-Bibliothek; Bd. 9942). S.203, V. 309. Vgl. Suerbaum, Ulrich: Das elisabethanische Zeitalter. Durchges. und bibliogr. erg. Ausg. Stuttgart: Reclam, 2007 (Reclams Universal-Bibliothek; 8622). S. 197. Mysterienspiele gelten als Vorläufer des elisabethanischen Theaters. Biblische Stoffe wurden in einer Mischung aus Heilsgeschichte und Schwank von Laienschauspielern bei Volksfesten dargeboten. Vgl. 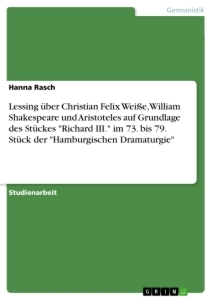 Baumann, Uwe: Shakespeare und seine Zeit. Stuttgart: Klett, 1998. S. 16-17. Vgl. 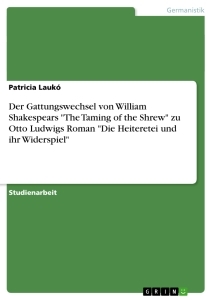 Gelfert, Hans-Dieter: Shakespeare. München: Beck Verlag, 2000. (C.H. Beck Wissen in der Beck’schen Reihe; Bd. 2055). S. 74. Vgl. Weiß, Wolfgang: Die dramatische Tradition. In: Shakespeare-Handbuch. Die Zeit- Der Mensch- Das Werk- Die Nachwelt. Hg. v. Ina Schabert. 5. Auflage. Stuttgart: Alfred Kröner Verlag, 2009. S. 52-53. Vgl. Suerbaum, 2007. S. 198. Vgl. Weiß, 2009. S. 55-56. Vgl. Pfister, Manfred: Die heiteren Komödien. 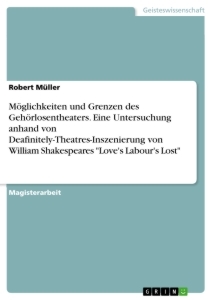 In: Shakespeare-Handbuch. Die Zeit- Der Mensch- Das Werk- Die Nachwelt. Hg. v. Ina Schabert. 5. Auflage. Stuttgart: Alfred Kröner Verlag, 2009. S. 376. Vgl. Suerbaum, 2007. S. 199. Vgl. Snyder, Susan: The Comic Matrix of Shakespeare’s Tragedies. Princeton: Princeton University Press, 1979. S. 57. Vgl. Tuck-Rozett, Martha: The Comic Structures of Tragic Endings: The Suicide Scenes in Romeo and Juliet and Antony and Cleopatra. In: Shakespeare Quarterly, Bd. 2. Hg. v. Folger Shakespeare Library. Washington: George Washington University Press, 1985. S. 153. Ein Liebespaar muss, bevor es glücklich vereint wird, zahlreiche Abenteuer bestehen. Die leidenschaftliche und treue Liebe ist der höchste Wert. John Lyly gilt als wichtigster Vertreter dieser Untergattung. Vgl. Weiß, 2009. S.58. Vgl. Snyder, Susan: Romeo and Juliet: Comedy into tragedy. In: Shakespeare's early tragedies. A collection of critical essays. Hg. v. Mark Rose. Englewood Cliffs: Prentice Hall, 1995. S. 108f. Shakespeare, 2009. S. 46, V. 112-113. Vgl. Suerbaum, 2007. S. 202. Shakespeare, 2009. S. 54, V. 138-142. Francesco Petrarca (1304-1374): Im Vordergrund der Dichtung Petrarcas stand die Verzweiflung über die nicht erwiderte Liebe zu einer Frau und deren Hochpreisung. Vgl. Tetzeli von Rosador, Kurt: Die nichtdramatischen Dichtungen. Petrarkismus. In: Shakespeare-Handbuch. Die Zeit- Der Mensch- Das Werk- Die Nachwelt. Hg. v. Ina Schabert. 5. Auflage. Stuttgart: Alfred Kröner Verlag, 2009. S. 576. Vgl. Suerbaum, 2007. S. 203-204. Vgl. Shakespeare, 2009. S. 20, V. 160-238. Vgl. ebd. S. 30, V. 91-92 u. S. 48f., V. 44-53.
 ebd, S. 50, V. 52-53. Vgl. Snyder, 1979. S. 60. Vgl. Snyder, 1995. S. 107. Vgl. Shakespeare, 2009. S. 12-14, V. 33-80. Vgl. Snyder, 1979. S. 59. Vgl. Tuck-Rozett, 1985. S. 154. Vgl. Mehl, Dieter: Die Tragödien Shakespeares. Eine Einführung. Berlin: Erich Schmidt Verlag, 1983. (Grundlagen der Anglistik und Amerikanistik; Bd. 13). S. 36-37. Vgl. Tuck-Rozett, 1985. S. 155. Vgl. Pfister, 2009. S. 381. Shakespeare, 2009. S. 66, V. 109-111. Vgl. Snyder, 1995. S. 110. Shakespeare, 2009. S. 78, V. 90; Vgl. auch S. 98, V. 14-15. Vgl. Tuck-Rozett, 1985. S. 156. Vgl Shakespeare, 2009. S. 32-24, V. 18-49. Vgl Snyder, 1979. S. 64. Shakespeare, 2009. S. 58. V. 7-13. Vgl. Snyder, 1979. S. 5. Vgl. Weiß, 2009. S. 47. Vgl. Baumann, 1998. S. 72. Vgl. Suerbaum, 2007. S. 170. Vgl. Gelfert, 2000. S. 47. Vgl. Suerbaum, 2007. S. 174. Vgl. Weiß, 2009. S. 53. Vgl. Mehl, 1983. S. 20.